Cost: $5 General Admission, Free for CHS Members, plus one guest per membership. Penny Nakatsu is a veteran of the 1968-1969 Black Student Union-Third World Liberation Front-Black Student Union (BSU-TWLF) Strike at San Francisco State College. She was a co-founder of the Asian American Political Alliance (AAPA), a student organization promoting progressive political action by persons of Asian ancestry. During the Strike, she was AAPA's primary representative to the TWLF Central Committee. After the strike ended in March 1969, she was one of the students, as well as community members and scholars who developed the ethnic/Third World studies curriculum. 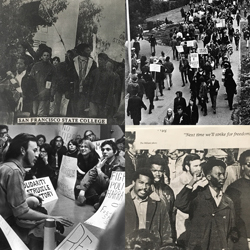 Images and Photos courtesy of (from left to right and top to bottom): Ramona Tascoe and the BSU Strike Founders’ Collection, from "Crisis at SF State" © 1969 by Insight Publications, Photo courtesy Bruce Hartford and Foundsf.org, Ramona Tascoe and the BSU Strike Founders’ Collection.